SOUTH BEND, Ind. 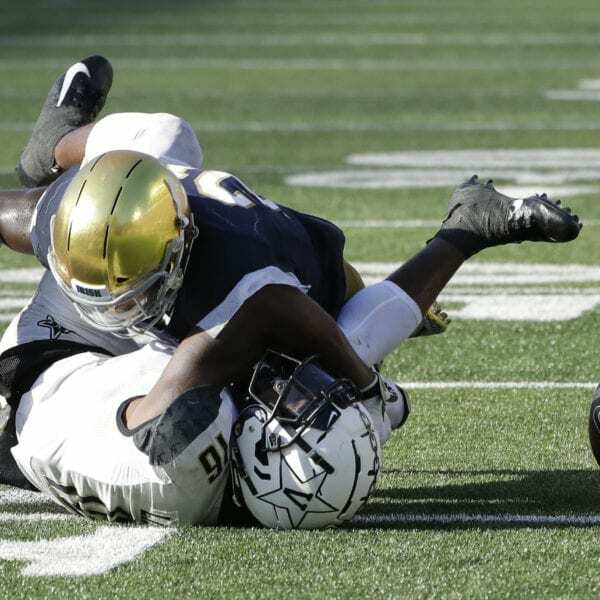 (AP) — Jalen Elliott knocked the ball loose from Vanderbilt receiver Kalija Lipscomb with 1:07 remaining to give Notre Dame a fourth-down stop and No. 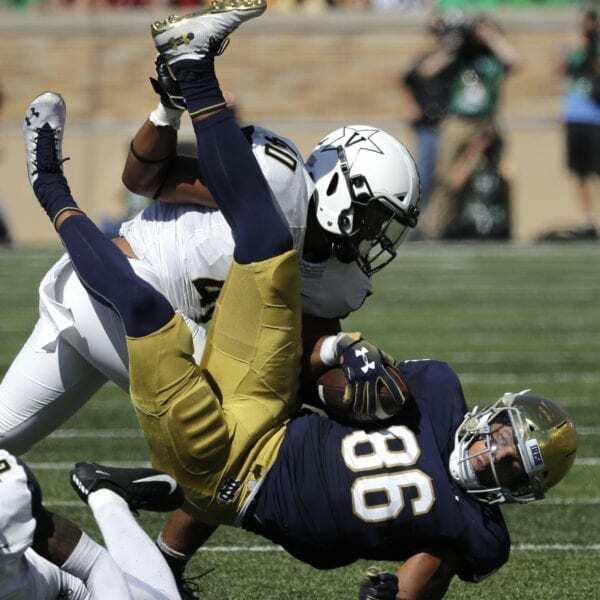 8 Notre Dame held on for a 22-17 victory over the Commodores on Saturday. 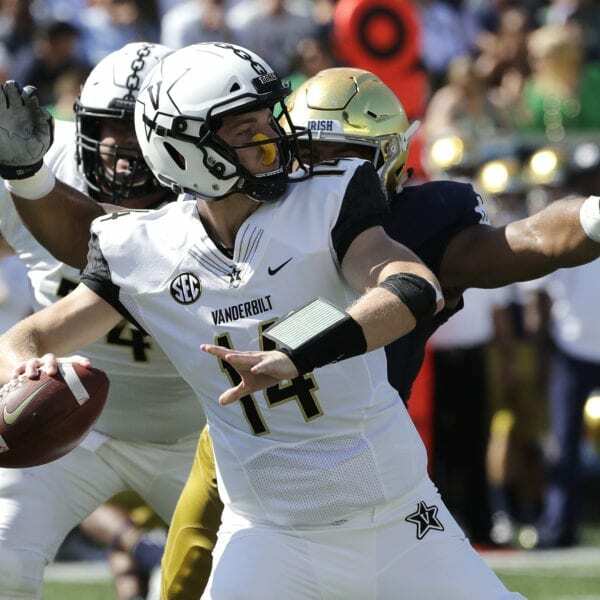 Kyle Shurmur threw for 326 yards and one touchdown for Vanderbilt (2-1), rallying his team back from a 16-3 halftime deficit. 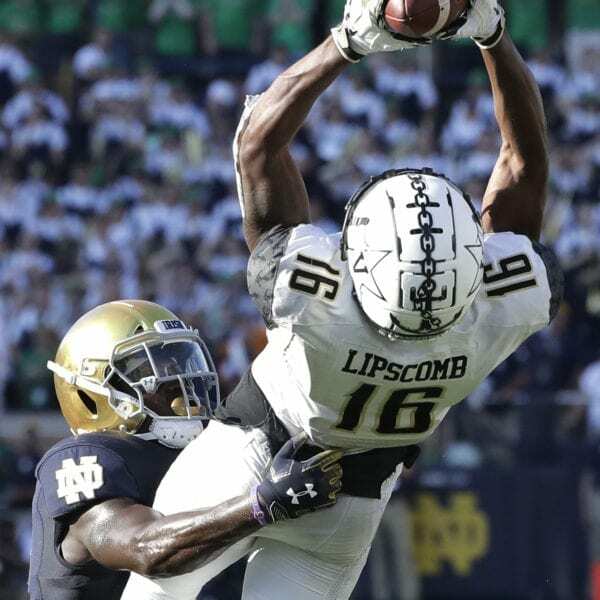 His fourth-and-4 pass from the Notre Dame 31 to Lipscomb, who caught a game-high 11 passes for 89 yards, was nicely thrown and the receiver almost made a reaching catch at the 11. But the safety Elliott, with some help from the ground, knocked the ball loose and incomplete. Vanderbilt finished with 420 yards to 380 for the Irish, who did not turn the ball over but got three from the Commodores. Notre Dame, which entered the game 104th in rushing offense at 124.5 yards per game, finished with 245 rushing yards. “That’s an SEC team and we ran well today,” Kelly added. Elliott had a pair of interceptions last week as Notre Dame held off Ball State, a 34 ½-point underdog, in a 24-16 victory. Vanderbilt was a 14-point underdog but did not play like one. Wimbush, who had 297 passing yards but three interceptions in the 24-16 victory against Ball State, threw for 122 yards and added 84 yards on the ground, including a 13-yard scramble for a touchdown as Notre Dame took an early 10-0 lead late in the first quarter. After being sacked four times and finishing with minus 7 rushing yards against Ball State, Wimbush was not sacked and did not make a turnover. 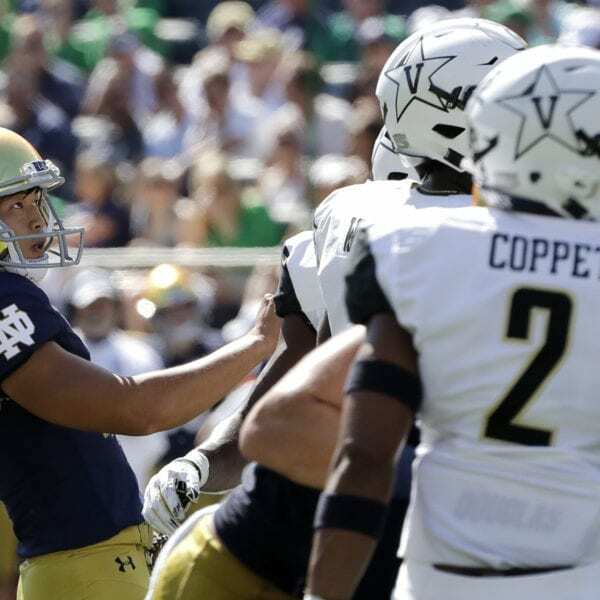 Notre Dame got a 2-yard TD pass from backup quarterback Ian Book to tight end Nic Weishar early in the fourth quarter for a 22-10 lead, the Irish struggled over the last three quarters and had to hold on. “We have to keep our foot on the pedal for all four quarters,” Wimbush added. 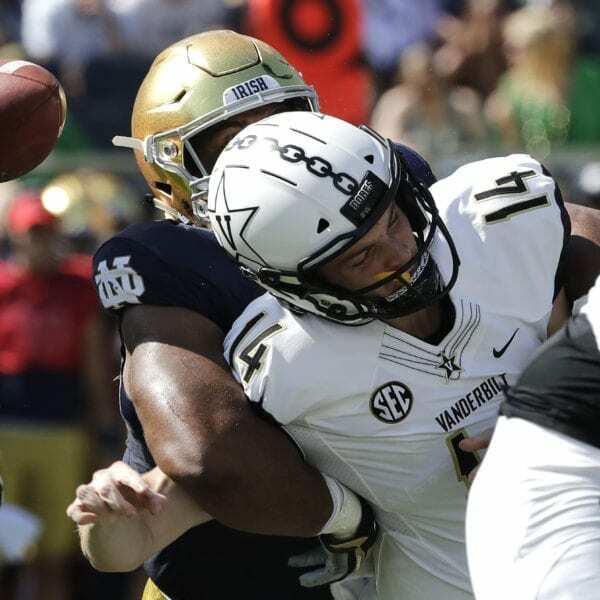 Notre Dame: After a strong start with 161 total yards while taking a 10-0 lead in the first quarter, the Irish struggled over the next two, totaling 111 with just 25 yards in the third quarter as Vanderbilt closed the deficit to 16-10. Two of three first-half drives of 10 plays by Notre Dame ended in field goals by Justin Yoon, though the kicker missed a short field-goal attempt that would have put the Irish up by eight. With Notre Dame leading 13-0 midway through the second quarter, Vanderbilt had its first good drive of the first half ended on a weird play that resulted with Irish corner Justin Love recovering the football in the end zone. Shurmur completed a 20-yard pass to Donaven Tennyson near the Irish end zone. As Tennyson attempted to score, safety Alohi Gilman stripped the ball out high into the air, with players from both sides going for it before the football ended in the end zone. 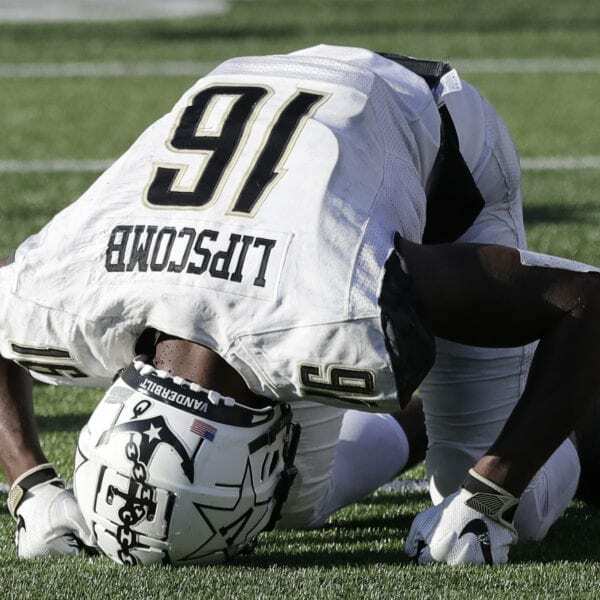 Vanderbilt running back Khari Blasingame attempted to recover for a Commodore TD, but the ball squirted loose where Love recovered it for a touchback with 5:10 left before halftime. Yoon, who started his football career as an eighth-grader at Nashville’s Harding Academy, kicked three first-half field goals (26, 33 and 46 yards) to pass Craig Hentrich (1989-92) and become the school’s all-time leading placekicking scorer with 297 points. Only Allen Pinkett (1982-85) has more points (320) in his career. Vanderbilt: The Commodores return home Saturday to open their SEC season against South Carolina. Notre Dame: The Irish play their first road game of the season Saturday at Wake Forest. Be the first to comment on "No. 8 Notre Dame Holds On For 22-17 Victory Over Vanderbilt"